Judi Dench has been nominated for Best Actress at the 2014 Oscars for her role in Philomena, the true story of a woman forced to give up her child for adoption in 1950s Ireland. She stars opposite Steve Coogan, who plays a journalist helping her to discover what happened to her son. It’s Dame Judi’s seventh Oscar nomination. She has won only once: in 1999 for her supporting role in Shakespeare in Love. How are you? I hear you’re shooting The Best Exotic Marigold Hotel 2 in India. I’m grand, thank you. Yes I’m in Jaipur. I bet you’re going to say “I bet it’s really hot.” But it’s been very rainy, with thunderstorms and things! It’s a bit chilly if you haven’t brought enough wool! 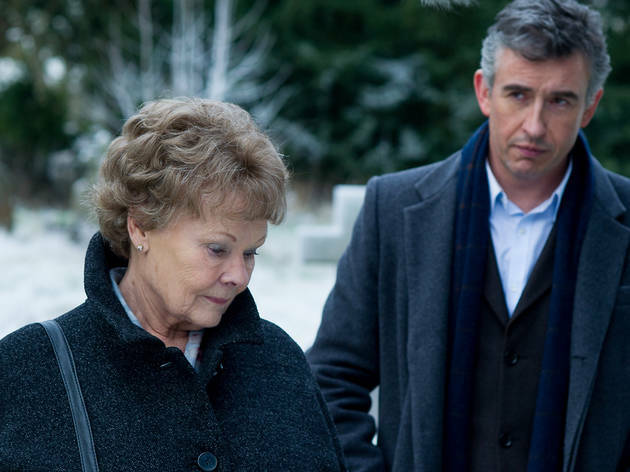 Why do you think Philomena has been such a success in the UK and US? It’s the story. Strangely, people thought it would be a polemic against the Roman Catholic Church, which it isn’t in any way. I think it’s an affirmation of somebody’s faith. 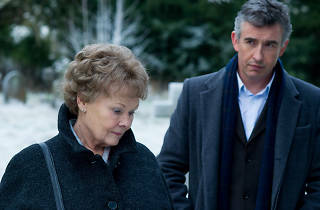 That’s what makes Philomena such an extraordinary woman. She went through that and came out the other side with her faith intact. I think it’s phenomenal. Have you met her? She’s the most extraordinary woman. Really an extraordinary person. She was on Piers Morgan Live with Harvey Weinstein. Will she be at the Oscars? I don’t know, I hope so. She seems to be coping with fame very well. It’s wonderful for her. She deserves it. Were you confident about your Irish accent going into this? My mother was from Dublin and my father was brought up there, so it’s not far away from my roots. Say it was South African or something, then I’d have been very, very frightened. You’ve been nominated for Oscars seven times now and you won in 1999 for Shakespeare in Love. Do you have fun on the night? Yes, we always have a wonderful time. That year I went with Michael [her late husband] and my daughter Finty, and we had a lovely time. You start getting ready at half eight in the morning—people come and do your nails! It’s wonderful. Then you see famous people. You never imagine for a minute you’re going to stand next to Jack Nicholson! We get very overexcited in our family. I remember at the first one being with Helena Bonham Carter and getting hysterical afterwards. We said: “Here we all are at dinner, all dressed up with nothing to show for it, nothing to take home! But it is very exciting. It’s very long, but it’s very exciting. It’s good luck if you win. But it’s wonderful to be there. You shouldn’t mind about not winning. But it must have been lovely to win? It was absolutely thrilling. I don’t remember much about it. I was stunned. Did you have a speech ready? No, no, no, I certainly hadn’t prepared anything. I just remember Robin Williams curtseying. That’s all I can remember. Then I went up in the lift with somebody frightfully famous. I can’t remember who! Did it take much persuading to get you back to India in the middle of a wet London winter to make The Best Exotic Marigold Hotel sequel? No, I didn’t need any persuading at all! To be back here with friends in India, which is such an extraordinary place—how lucky we are! We keep saying it every day!